As the Barrett family’s peaceful suburban life is rocked by an escalating series of disturbing events, they come to learn that a terrifying and deadly force is after them, one which may have arrived from beyond the stars. This one was waiting for a long time already in my long row of films that I want to see. And since I’m the only one in this household who can appreciate a good exciting horror / SciFi movie, I snuggled myself in my comfy chair in the middle of the night and finally watched it. Firstly, this movie isn’t really a horror. It’s more of a “Signs” meets “ET“, but this time the unfriendly version. The theme of humans being used for experiments by extraterrestrials is nothing new. But despite the minimal use of special effects, this film still manages to retain the tension. For me there was not a single scary moment. On the other hand it has to be something huge to scare me. Most of the times I can feel it from miles aways something scary is going to happen. I thought the boy who played Sam (Kadan Rocket) was brilliant. Not easy to play such a convincing role at that age. 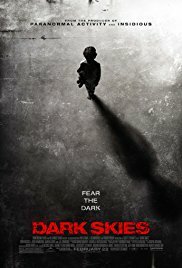 “Dark Skies” is an entertaining film about something that nobody has an answer to. Namely, are we alone in this universe ? Or have we been lying under a microscope for years ?